My husband is a bit truffle obsessed. When we dine out it's pretty safe to say any item on the menu that has the rare ingredient in it, he's ordering it. Since truffles are incredibly expensive and are hard to come by I thought I would create a snack for my man with truffle ingredients that are easily found in your grocer. I selected both black truffle salt and black truffle butter. Combining the two gave a rich but not overpowering flavor to the plain popcorn. I added the crispy prosciutto for another layer level because lets face it, everything is better with prosciutto. Not only does this snack taste like heaven, it is super easy and quick to make, double win! 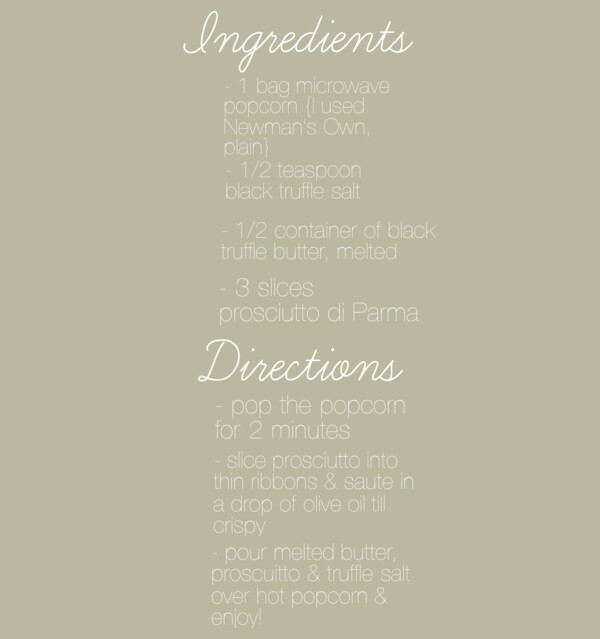 Its elegant enough for entertaining and can even be topped with a little grated parmesan for some added flavor. Enjoy! whoa, amazing!! thanks for sharing!! x.
UM. YUM. Get in mah belly.